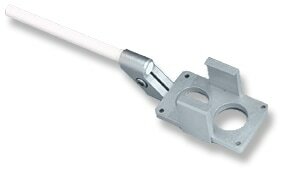 Our MXE & MXP series of headstage mounts and pipette holders utilize ceramic rods to eliminate drift introduced by plastic mounting rods. MXE headstage mounts come in a variety of lengths to accommodate a wide range of setups, and are compatible with Axopatch CV-4 headstages. 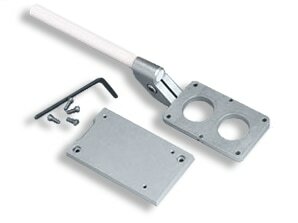 MXE headstage mounts use a .312″ dia. ceramic rod that is aligned to the mounting plate such that its axis of rotation is the same as the electrode on the amplifier headstage. Attachment of the headstage is accomplished by screwing it to the mounting platform with four cap screws, included. MXE-HS headstage mounts come in a variety of lengths to accommodate a wide range of setups, and are compatible with Axoclamp HS-2A/B headstages. 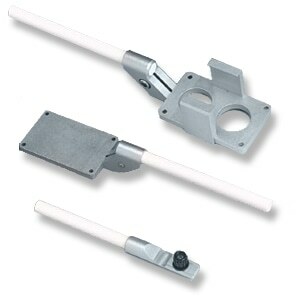 MXE headstage mounts use a .312″ dia. ceramic rod that is aligned to the mounting plate such that its axis of rotation is the same as the electrode on the amplifier headstage. Attachment of the headstage is accomplished by clamping it to the mounting platform with two side clamping bars. Mount MXE-HEKA headstage adapter plate is designed as an interface between our MXE series headstages. Attachment of the headstage is accomplished by screwing it to the adapter mounting plate with two screws, and then attaching that to the mounting platform with four cap screws, included. 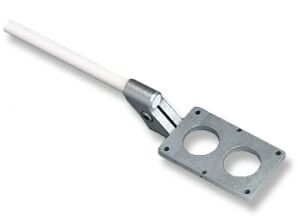 MXP probe / pipette holders use an .312″ diameter ceramic mounting rod to ensure thoroughly stable and electrically isolated probe/ pipette mounting. 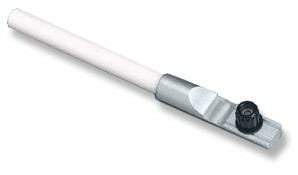 MXP probe / pipette holders come in a variety of lengths to accommodate the wide range of setups.